WASHINGTON, DC, USA, April 8, 2019 /EINPresswire.com/ -- The Commercial Diplomats Club is an initiative launched by the International Union of Bilateral Chambers of Commerce and Industry (IUBCCI), which together with the US Institute for Commercial Diplomacy and the economic and commercial diplomats of the foreign embassies accredited to Washington, DC have determined that it is necessary the creation of an elitist entity with the aim of creating a community of interests and ideals. 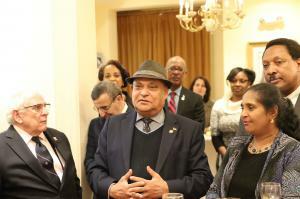 Members of the diplomatic corps in Washington, DC and representatives of the business community gathered for the inauguration and official opening of the Commercial Diplomats Club. In attendance were 37 guests, out of which 23 Ambassadors and diplomats representing a total of 18 nations: Albania, Angola, Bangladesh, Bahamas, Botswana, Bolivia, Dominican Republic, Moldova, Mauritius, Morocco, Myanmar, Nigeria, Panama, Tanzania, Togo, Trinidad and Tobago, Switzerland and Uzbekistan. Addressing the distinguished guests at the event, President of IUBCCI Manuel Oancia outlined the current scene of the “New Economy” that calls for permanent cooperation between the economic and commercial diplomats of various countries, capable of responding to current challenges and transformations of the global economic activities. “At this point, the economic diplomacy is not just the attribute of career diplomats, but it appeals to national expertise in specific areas, from either the public or the private sector. Therefore, the economic and commercial diplomat becomes an interdisciplinary integrator.” said Oancia. H.E. Sooroojdev Phooker, Ambassador of Mauritius to the United States of America and Mexico congratulated IUBCCI’s leadership for the initiative and as a honorary member emphasized that the goals of the Club will have to go beyond mere commerce and include other important aspects in the economy of nations. 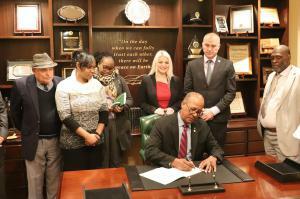 Within the inauguration reception took place the official signing of the Charter of the Commercial Diplomats Club. Among the primary signatories were the President of IUBCCI, as well as Ambassadors and diplomats from Mauritius, Bahamas, Morocco, Angola, Moldova, and Nigeria. The Charter proclaims as aims the creation of a community of interests and ideals between the business and the diplomatic communities so as to work on solutions to employ the international machinery for the promotion of the economic advancement of all peoples and to attain a global economic harmony through the means of economic and commercial diplomacy. The event was hosted at the historic L. Ron Hubbard House. Sharing what once L. Ron Hubbard said “On the day we can fully trust each other there will be peace on Earth,” Mr. Bill Runyon, Chairman of the L. Ron Hubbard Foundation, explained that peace thus is a condition, a state of trust. “Trust is the ‘invisible hand’ that drives wealth of nations, creates economic stability, and forms relationships whether personal or international,” continued Mr. Runyon. The members of the Commercial Diplomats Club will meet in a working meeting every month, each having a specific theme of a different country touching all sorts of aspects as: FinTech, IT hubs, solar energy, space, environment and clean energy, Hollywood movie industry, exports and trade and others. 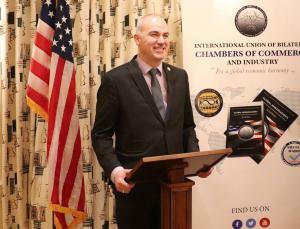 The International Union of Bilateral Chambers of Commerce and Industry (IUBCCI) is the world’s largest non-profit organization of the bi-national (bilateral) chambers of commerce and industry and all of their Unions, Federations or Joint Business Councils dedicated to fostering the promotion of bilateral trade and commerce, and the exchange of culture and humanity through means of economic diplomacy. IUBCCI connects closely with the diplomatic community to facilitate collaboration between other countries and the U.S. public and private sector leaders to further a common economic interest and cooperate on solutions for the global economy and security.